Democratic candidate for U.S. Senate Michelle Nunn, of Georgia, and her daughter Elizabeth greeting voters on Oct. 15 in Fulton County. Republicans got favorable news in Georgia on Tuesday, where a Monmouth University poll put their candidate, David Perdue, eight points ahead of the Democrat Michelle Nunn. The poll is something of an outlier relative to the consensus — nonetheless, the last seven surveys we’ve added to our database show a tie or a Perdue lead, reversing a string of polls that put Nunn ahead. Perdue now leads Nunn 49 percent to 48 percent in the FiveThirtyEight forecast — with the Libertarian Amanda Swafford, whose vote share has declined slightly in the most recent surveys, projected to get 3 percent of the vote. Perdue’s chances have improved of getting to 50 percent of the vote on Nov. 4, which would allow him to avoid a runoff. Still, a runoff in Georgia remains more likely than not. Our model gives Perdue about a 30 percent chance of winning outright on Nov. 4, while Nunn is down to only about a 10 percent chance of doing so. 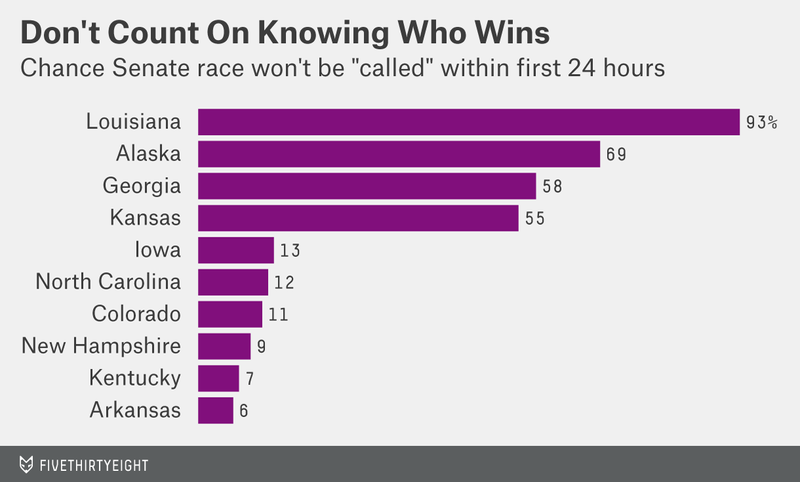 The rest of the time, the race will be runoff-bound. As we’ve written before, Georgia is not the only race that might require “overtime.” Our model estimates that while Republicans have a 64 percent chance of winning the Senate eventually, there’s only a 27 percent chance they’ll be able to claim their victory within the first 24 hours or so after polls close on Nov 4. Democrats are even less likely to win a quick victory — they have just a 12 percent chance. The other 60 percent of the time, it will take days or weeks to sort everything out. The chart below lists the states that are the biggest part of the problem. Louisiana tops the list. Its Nov. 4 “jungle primary” ballot includes eight candidates; the top two will advance to a Dec. 6 runoff if none wins a majority on Nov. 4. Previously, we’d been assuming Louisiana was certain to go to a runoff. That was a slightly lazy assumption, so as we’ve done for Georgia, we’re now modeling both the primary and runoff ballot in Louisiana. The Democratic incumbent, Mary Landrieu, has held the plurality in most polls of the primary ballot, usually with numbers in the low 40s. It’s a long way to get from the low 40s to 50 percent, especially with so many candidates on the ballot, but there are a fair number of undecided voters. With all votes allocated our model projects Landrieu to get about 45 or 46 percent of the vote on Nov. 4. It has Republican Bill Cassidy at 41 or 42 percent, another Republican, Rob Maness, at about 10 percent, and the other candidates at 3 to 4 percent of the vote combined. It’s still not quite clear where Landrieu would pick up the rest her votes. Her approval ratings are stuck at about 40 percent and her two major challengers are conservative Republicans — there’s not a liberal spoiler in the race. But Louisiana can be a tricky state to poll; on the basis of the intrinsic uncertainty in the contest, the model gives her about a 6 percent chance of somehow getting to 50 percent on Nov. 6. It also gives Cassidy a one percent chance of doing so; he’d need a number of Maness voters to defect to him at the last minute. Still, a runoff is very likely. Alaska is another huge problem for those hoping for a quick resolution on Nov. 4. In fact, its polling places don’t close until 1 a.m. Eastern time on Nov. 5. The polls in Alaska haven’t been telling a consistent story lately, but the race seems to have tightened, and the Democratic incumbent Mark Begich’s chances of surviving have improved. An internal poll put out by the Republican Dan Sullivan’s campaign on Tuesday showed him with a 4-point lead, while a poll for the Democratic Senate Majority PAC showed a tied race. Our forecast is somewhere in between, showing a 1- or 2-point lead for Sullivan but with a high degree of uncertainty. It’s entirely possible that Sullivan could still win by a margin in the mid-to-high single digits — or that Begich could do so. But if the margin is anywhere in between, we might not know the outcome for days or weeks. In 2008, when Begich beat the Republican Ted Stevens by 1.2 percentage points, most news organizations did not declare him the winner until Nov. 19 — 15 days after polls closed. Likewise, in 2010, when the Republican incumbent Lisa Murkowski held her seat as a write-in candidate by 2.5 points over fellow Republican Joe Miller, it took about two weeks to declare a winner. Not all races take quite that long to count. In Alaska’s senate race in 2004, the Democrat Tony Knowles conceded to Murkowski two days after the election; he eventually lost to her by 3 percentage points. In 2006, Sarah Palin won Alaska’s governorship by 7 percentage points and most news organizations called the race the morning after the election. Still, our assumption is that either Begich or Sullivan would have to win by at least 5 percentage points for Alaska to be declared in time for the evening news on Nov. 5. Our model says there’s about a 30 percent chance of that, and a 70 percent chance that things will take at least a little longer. We already discussed Georgia, so let’s skip ahead to Kansas. It presents two problems. First, the independent Greg Orman has about a 50 percent chance of winning. Orman takes center-left policy positions, but he hasn’t said whom he’ll caucus with — in fact, he’s said it might depend on which party controls the majority. His decision might take a long time to sort out, especially since it might not be clear which party has the majority in the first place. Alternatively, it’s possible the Republican incumbent Pat Roberts will prevail, but by such a close margin that the race will require a recount or otherwise take a long time to call. Roberts trails Orman by just 0.3 percentage points in our latest forecast. 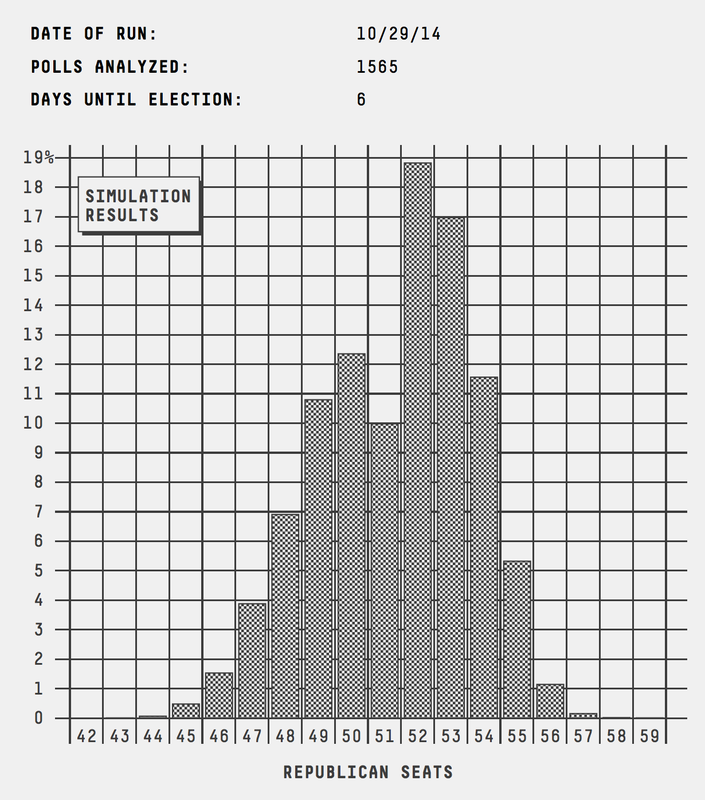 Our model assumes that races go to “overtime” whenever the vote finishes within 0.5 percent. That threshold, 0.5 percent, is a trigger for automatic recounts in some states. In other states, a recount wouldn’t necessarily be required. But mail and absentee ballots can take some days to count. There can be questions about provisional ballots. The lawyers can get involved. Under these circumstances, news organizations would usually hold off for at least a few days before declaring a winner. Any of the close races could potentially fall into this category. There’s about a 13 percent chance that Iowa will finish within 0.5 percent, a 12 percent chance in North Carolina, an 11 percent chance in Colorado, and so forth. With so many tight races this year, it’s better than even money that at least one state will fall into Recountland. There are two pieces of hidden good news for Republicans. First, if they’re declared the winner without going to overtime, that likely means they’re headed to a very clear victory. In those simulations where they won without going to overtime, they eventually finished with an average of 54 seats once all states were counted. Second, Republicans are about 60-40 favorites to eventually win the Senate if the contest does go to overtime. This is largely because of Louisiana, where Cassidy would be a reasonably clear favorite in a potential runoff. But here’s one way to think about next Tuesday. There’s a 25 or 30 percent chance of a big, sweeping win for Republicans. There’s a 10 or 15 percent chance the Democrats retain the Senate with surprising ease. And there’s a 60 percent chance that we’ll be sweating out the races on a state-by-state basis, possibly for weeks to come.